Free download SWITZ Antivirus latest version. 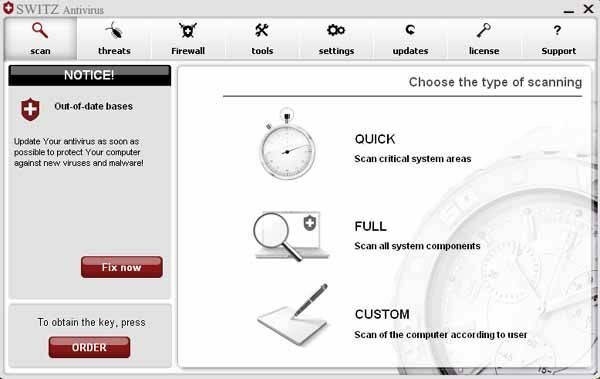 It is a newly developed antivirus software developed by SWITZ (based in Seychelles) in April 2013. SWITZ Antivirus program is compatible with all versions of Windows. This antivirus program is available free to try for 30 days. SWITZ Antivirus program has two type of purchased license. First one is 1-Year license that can be purchased for $39 while the second one is life time license. You can purchase lifetime license of SWITZ Antivirus for $139. By purchasing the license of SWITZ Antivirus, you will get guarantees of high level service, gain additional confidence in the company and forget about any problem of protection. There are many advantages of SWITZ Antivirus, firstly, it has Heuristic analyzer, that can automatically detect and identify malicious software. It will verify the files that are running on your computer in real time. Its firewall will protect against network threats and unauthorized access application and programs that are installed on your PC. Its Web filter protects you from the websites containing malicious software. There are also some disadvantages such as, it requires to remove/uninstall any other antivirus program on your computer. So, SWITZ Antivirus program is not compatible with any other antivirus program. It is very easy to download and install SWITZ Antivirus. Just download the setup of trial version and run it. During the installation process, it will ask you to make sure you have not any other antivirus program installed, it you will make check mark, it will show you “Next” button.